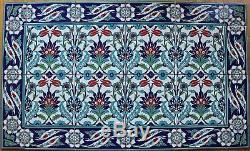 39 1/2" x 23 3/5" (80cm x 60cm) Turkish ceramic tile set. Set is consist of 8 7 7/8"x7 7/8", 12 3 7/8"x7 7/8" and 4 3 7/8"x3 7/8" tiles. Main colors on this tile are green, turquoise, red and dark blue. They can be molded on the wall or framed. These tile is decorated with Ottoman floral designs. These tiles have layer of glaze, so they can be used at moist areas. White-yellow area on the picture are due to light reflection. 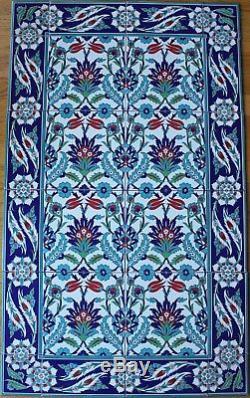 The item "40x24 Turkish Iznik Tulip, Carnation & Floral Pattern Ceramic Tile Panel Mural" is in sale since Friday, November 3, 2017.